Research appearing today in Nature Communications finds useful new information-handling potential in samples of tin(II) sulfide (SnS), a candidate "valleytronics" transistor material that might one day enable chipmakers to pack more computing power onto microchips. The research was led by Jie Yao of the Department of Energy's Lawrence Berkeley National Laboratory (Berkeley Lab) and Shuren Lin of UC Berkeley's Department of Materials Science and Engineering and included scientists from Singapore and China. Berkeley Lab's Molecular Foundry, a DOE Office of Science user facility, contributed to the work. For several decades, improvements in conventional transistor materials have been sufficient to sustain Moore's Law - the historical pattern of microchip manufacturers packing more transistors (and thus more information storage and handling capacity) into a given volume of silicon. Today, however, chipmakers are concerned that they might soon reach the fundamental limits of conventional materials. If they can't continue to pack more transistors into smaller spaces, they worry that Moore's Law would break down, preventing future circuits from becoming smaller and more powerful than their predecessors. That's why researchers worldwide are on the hunt for new materials that can compute in smaller spaces, primarily by taking advantage of the additional degrees of freedom that the materials offer - in other words, using a material's unique properties to compute more 0s and 1s in the same space. Spintronics, for example, is a concept for transistors that harnesses the up and down spins of electrons in materials as the on/off transistor states. Valleytronics, another emerging approach, utilizes the highly selective response of candidate crystalline materials under specific illumination conditions to denote their on/off states - that is, using the materials' band structures so that the information of 0s and 1s is stored in separate energy valleys of electrons, which are dependent on the crystal structures of the materials. In this new study, the research team has shown that tin(II) sulfide (SnS) is able to absorb different polarizations of light and then selectively reemit light of different colors at different polarizations. This is useful for concurrently accessing both the usual electronic - and the material's valleytronic - degrees of freedom, which would substantially increase the computing power and data storage density of circuits made with the material. "We show a new material with distinctive energy valleys that can be directly identified and separately controlled," said Yao. 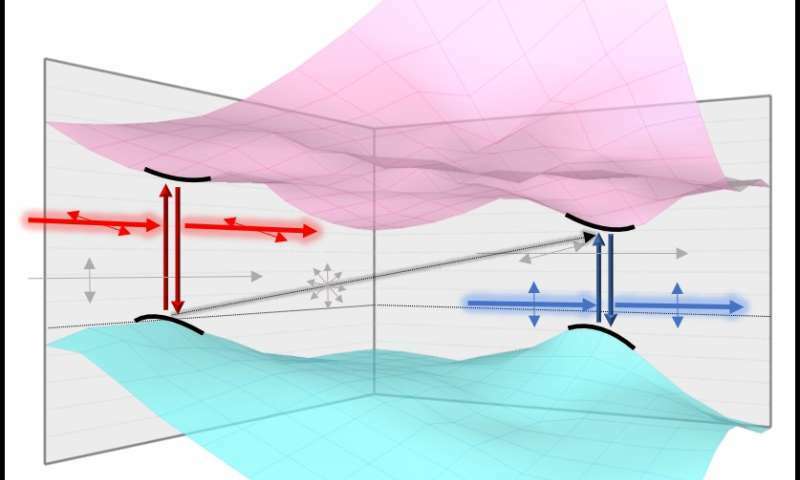 "This is important because it provides us a platform to understand how valley signatures are carried by electrons and how information can be easily stored and processed between the valleys, which are of both scientific and engineering significance." Berkeley Lab's "Beyond Moore's Law" initiative leverages the basic science capabilities and unique user facilities of Berkeley Lab and UC Berkeley to evaluate promising candidates for next-generation electronics and computing technologies. Its objective is to build close partnerships with industry to accelerate the time it typically takes to move from the discovery of a technology to its scale-up and commercialization. Ferroelectrics molecules can use center O2 as a no volatile switch and the 8 corners of the ferroelectric molecule can be used in spintronics. Densities exceeding Tera words/cu.cm. Quantum Holographic storage could bring extremely fast read and write data storage times. Data storage has been instrumental in the advancement of may fields of science and Bus. We continually need bigger, faster, cheaper, and better data storage for continued advancements.